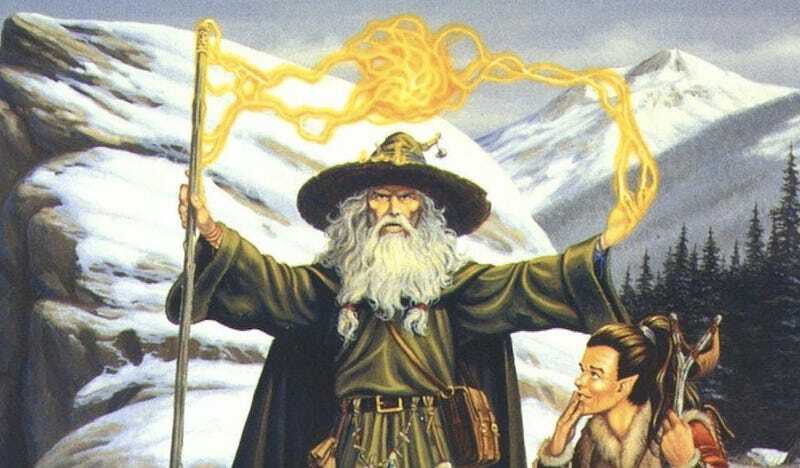 Wizards are the most powerful characters in Dungeons & Dragons, as the hundreds of spells available to Magic-Users, IIllustionists, Necromancers, Clerics, Druids, will attest. But for every Meteor Swarm, Time Stop and Resurrection there are a dozen spells that are utterly worthless. Here are 20 D&D spells almost no one has ever needed to cast. “Once this spell was cast the target could see clearly through blinding sunlight and heat shimmer. Reflected sunlight from a mirror had no effect on the target, and they were immune from being blinded by light spells.” So, uh… sunglasses, basically. In D&D, there’s a reasonably useful skill called Blink, which allows wizards to basically pop briefly over to the Astral plane, gives them a chance to move around, effectively teleporting a short distance and confusing (or escaping) foes. Basket Trick is Blink except you don’t get to choose where you move, but instead pop back into the physical in a random nearby basket. Not only is this a basket-specific teleport spell, you don’t even get to pick the basket. Another insane variation of the teleportation spell, Bowgentle’s specific version teleporting one being to a known location for a minute… and then immediately brought them back to their place of origin. It’s the 60-second teleport. Now, you may be the thinking that this could be useful for sending a brief message to people if nothing else, but the distance for this spell was 60 feet, and had to be in visible eyesight of the wizard. You could run 20 yards and be back again in two minutes. Need to browbeat someone, but don’t have the time to say actual words? Them cast Chastise (although you do have to cast the spell by saying words, so I’m not sure how much time it really saves). For bonus silliness, this spell only worked on people who offended the spellcaster, making it spectacularly situation-specific. This made corpses glow. That’s it. Perhaps it would be helpful in the daark, but it wouldn’t be nearly as helpful as the smple Light spell, which didn’t require a nearby dead person as a conduit. Even then, I’m trying to think of how often anyone would need to turn a corpse into a rotting nightlight, but I’m coming up empty. This spell transformed a small piece of wood into a 10-foot-long battle staff that wizards could wield. It sounds kind of useful… until you remember how long a 10 foot stick would be. For perspective, 10 feet is the length of the shortest possible pole vaulting pole. Now imagine trying to fight someone with a pole-vaulting pole, in a dungeon, where the length of the hallways are almost always exactly 10 feet wide. Exactly as it says on the tin—it lets when your depth changes. About the only time I can think of that this spell would be more useful than just paying attention to your surrounding is when you’re somehow in a submarine without a window, and I have yet to do this in a D&D game. If there are undead near enough you to be discovered by this spell, I guarantee they’ve already made their presence known. In the mood for some entertainment? Then cast this, which as its title suggest forces its target to dance uncontrollably to the exclusion of all else. In terms of incapaciting an opponent, it’s undeniably goofy, but it could be useful… until you learn it’s an 8th level spell, at which point wizards are actually traveling through dimensions, creating giant clouds of fire, bending entire groups of monsters to his/her will, and driving people insane. Making someone do a little jig doesn’t sound that useful now, does it? A spell that doesn’t just cook a grand meal, but also cleans up the kitchen aftwards (kitchen not included). If you have ever play a session of D&D where you needed to clean up a kitchen, I feel very sorry for you. This Druid spell transforms a stick into a club or a quarterstaff, which is to say a stick that does slightly more damage than the original stick. If you’re carrying a stick that you plan on turning into a staff at some point, just buy the stupid quarterstaff. One snowball. A single, solitary snowball, that at least hit its target no matter what. With snow. Somehow, this spell did damage to things other than fire creatures, but still, it’s basically a very embarrassing version of Magic Missile. A spell that mainly cured hangovers and drug withdrawal symptoms. While this would be an unbelievably spell in real life, why would any D&D player choose to fill up a spell slot with this thing when telling the gamemaster “My character sleeps in for another couple of hours” would have the same effect? Need your hands free? Then summon Tenser’s Floating Disc, a medium-sized bowl of force that can carry loads for you while floating behind the caster. Or, you know, you could spend a couple of gold pieces and get a goddamned backpack. A spell that kept wizards from getting wet, even if they enter a body of water. For the life of me, I can’t find any table that indicates there has ever been some kind of penalty for being wet in any edition of Dungeons & Dragons, meaning apparently this spell exists solely for the comfort of your imaginary character. A snowball spell would be significantly more useful.